This comic opens with a tour de force in ominousness: The most threatening "this means war" mutant supremacy rhetoric imaginable - spilling out of Jean Grey's mouth! That's merely the first twist in a wonderfully twisty build-up. 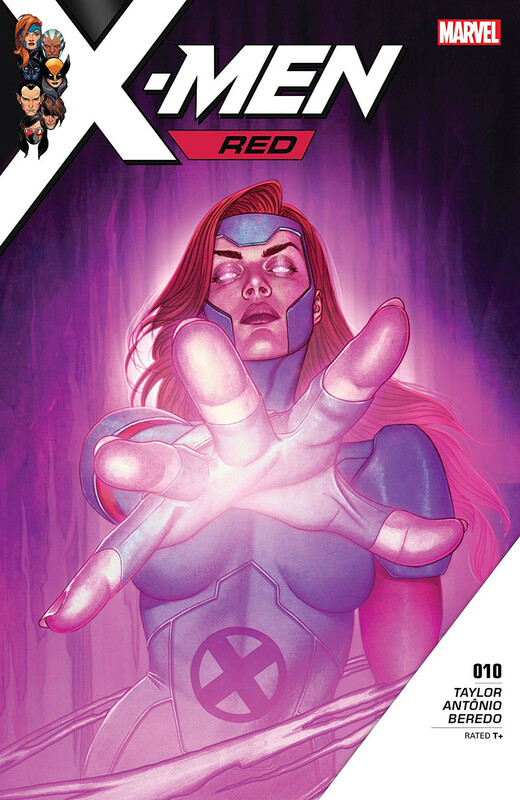 Cassandra Nova has stolen Jean's face and used it as her figurehead. She's also engineered a very public international hostage crisis. It's a titanic challenge for Jean and her team to overcome. This issue delivers a brilliant dose of counter-planning that takes the highest possible expectations and neatly leapfrogs right past them. I expect when this is all over, Cassandra's going to be in for some very harsh criticism of her villainous planning. Your climactic blow is a plot to turn public opinion against the X-Men? Really? Have you met the X-Men? It wouldn't be fair of me to go into detail describing how Jean and the Red team plan to meet this final threat. Every decision and development is delicious, and the finale builds an almost feverish anticipation for the climax to come. It's a Big Issue where Big Stuff happens, basically. Yet despite delivering tons of clever plotting and a no-expense-spared roster of guest stars, this issue is surprisingly short of action. It's (almost) all build-up. Although the visuals do convey rising tension well, they also feel like they're resting up in anticipation of the climax. This issue has a distinct shortage of detail until its last act. Only in the final pages does the art sharpen up in a "gird your loins, it's big battle time" way. Prior to that, we get some awfully messy conversation scenes. This isn't entirely a bad thing. The characters' faces are wonderfully expressive, particularly Jean's. Artistic attention and detail are not absent so much as they are carefully conserved. If the settings and supporting characters are forgettable, they do let the main characters stand out in contrast. There's a similar case of conservation going on with the colours. All of the brightness is reserved for the protagonists' costumes; the settings are muted and almost drab. The palette and the art are definitely suited to each other; I just wish the results were a little more powerful. I should also emphasize that if this issue genuinely is a "breather" for the artist and colourist, that bodes very well for the final issue. The same team delivered a stellar mix of action and emotion in the last issue, and this one's plot lays promising groundwork for an even bigger, bolder show in #11. A strong script piles up tremendous storm clouds in X-Men: Red #10. As stimulating as the ideas are, the visuals make it clear that those clouds aren't ready to burst yet. This issue does an excellent job of building tension and pushing the larger story forward. It lacks the artistic polish and decisive action it would need to be truly great on its own, though. I admit I'm relieved that this issue pushes the "contemporary American politics through a mutant lens" commentary deep into the background. Check the chyrons under the news pundits if you're thirsting for it.